With sights set on the Washington Attorney General’s Office, a sophisticated and articulate Christine Gregoire encountered a man on the campaign trail who doubted a woman could handle the job. “No, no. Women should not be generals,” he told her. But voters disagreed and sent her to the Attorney General’s Office in the “Year of the Woman,” the 1992 election cycle that brought women into American politics with a force. Known for her smarts and her lucid style, Washington’s top lawyer negotiated a substantial settlement with the tobacco industry in 1997 that prohibited the industry from marketing tobacco products to young people. Also during her tenure, the Attorney General’s Office appeared before the U.S. Supreme Court multiple times. In one case, the Court upheld Washington’s controversial ban on physician-assisted suicide. The Democrat grew up on a modest farm in Auburn, Washington where she learned to appreciate the importance of an education. Gregoire went on to earn a teaching certificate and a bachelor’s degree from the University of Washington, and a law degree from Gonzaga Law School. She met her future husband, Mike Gregoire, in 1971. They married and raised two daughters, Courtney and Michelle. Gregoire launched her legal career in 1977 as an Assistant Attorney General and quickly climbed the ranks to Deputy Attorney General. In 1988, Gregoire took over the Department of Ecology as Director. Gregoire served three terms as Attorney General before making a run at the Governor’s Office in 2004. The grueling match between Gregoire and Dino Rossi, a former State Senator, resulted in the closest gubernatorial election in Washington State history. She defeated Rossi in a 2008 rematch by a wider margin. "No, no. Women should not be generals," a male voter once told candidate Gregoire. Known for her articulate and assertive style, the three-term Attorney General negotiated a $206-billion settlement with the tobacco industry that prohibited marketing to youth. In 2004, Gregoire made American history when she narrowly won the Governor's Office by a breathtaking 133 votes. Roughly 2.8 million Washington voters cast ballots in the race. 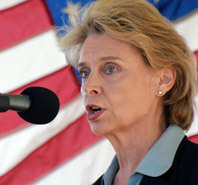 Gregoire is Washington's second woman governor and the first to win re-election.